Welcome to my stamp album! 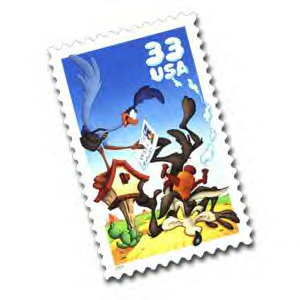 Postage stamps provide illustrations of historic and geographic events, discoveries, inventions that have shaped human civilization over the centuries. From Dinosaurs to Space Achievements. They reveal mankind's diverse customs, beliefs, art forms, and life styles and they map the continents, islands, oceans and rivers, and such natural wonders as geysers, volcanoes, canyons and ice gaps. Stamps depict thousands of life forms that inhabit the land and waters, from insects to whales, from windflowers to giant trees. Even Bugs Bunny! Their endless variety, beauty, color designs and the stories they tell delight and enlighten millions of people all over the world. This is my personal stamp collection. It depicts my interests, from old movies to space exploration. I've had a lot of fun finding stamps that suit me and cataloging when and where they were made, and will enjoy it even more when my daughter, Savannah, is old enough to share it with me. I've finally gotten around to updating this part of my website. Now, instead of waiting forever for a bunch of pictures to load, you only have to wait for one. Each page depicts a stamp and its press release. Kinda snazzy, huh? Eventually, there'll be a separate page for all my postmarked stamps, and one of these days I'll have enough energy to scan them all.